How are you? Are you enjoying the weather? I am loving it! Not too cold, but not too warm either, almost perfect! Anyway, whether you are busy or not, I hope you had some free time to play your favorite online game. But if not, here comes my weekly recap. This week started with a new release in Spectacular store. You probably think: "Not another collection of ordinary sunglasses! ", but I assure you, these are anything but ordinary. What's the catch? If you look closer, you may see that some of them have a sort of reflection on them. You can see various city landscapes and monuments, such as New York, or Paris Eiffel Tower, or some tropical beach. Yeah, I think this is really cool idea from Stardoll team. The only downside is, of course, that they go in our beauty parlor, and unlike on pic above, we cannot wear them under Tress Up hairstyles. 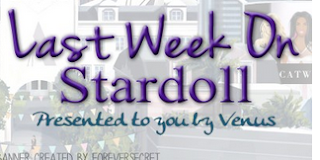 Oh, well..
On Wednesday, we got something never seen on Stardoll before. (Well, at least, not in Stardoll stores.) I am talking, of course, about new release of face mask and shadings in Transform store. Seems like Stardoll got an idea from various hair designers on Stardoll, who also design face masks and face shadings, contours for our medolls, making our dolls look more realistic. I like this. I haven't really tried them yet on my doll, but I love the idea and I'd love to see more of these, preferably some that would look good on pale faces. I also love the lip shadings. Those are quite cheaper than stadesigned ones, but we have far less choices. On Thursday, we got new Callie's Picks decor collection, 4th so far, named "Botanical Gardens"
The collection is bright, colorful, and has some really nice pieces. I am loving the dog, and all other animals out there. It is inspired by this gorgeous interior and also, there is this black fence that can be very useful when creating outdoor inspired rooms. I like the bike too, but I think it might should have had more items, maybe 2 pages, because the theme has a lot of potential. On Friday, there was a new release in real brand inspired PPQ store, called "Spring Safari"
The collection is inspired by Spring/Summer 2015 PPQ collection, but to me, it seems more like winter, with white as a dominant color, and few items with icy blue shade. It is really beautiful, classical, as white can be worn with almost anything, and I am really loving it. Except my doll is totally pale, so white alone doesn't really look good on it. Still, with some mixing and matching I am sure I could create some nice, wearable outfits, though I do not plan on buying from the collection yet. I love the shoes, they are really classic and really wearable, as well as Sleeveless White Turtleneck, White Leather Party Jacket, and also the long white coat, whihc does not show up, for some reason, in the store. Overall, fantastic collection! And yesterday, Stardoll announced 30% off sale in Le Specs sunglasses store. Another news related to sunglasses, I know. The store is not quite popular on Stardoll, and it is not visible in all countries, but you can find the sunglasses with search function in starplaza. Prices are not that affordable, and 30% off is not a really great deal, as I am not much a fan of those sunglasses anyway. I'd rather stick with Spectacular store, and I already have a nice amount of sunglasses in my beauty parlor. Or not, I have no idea, it is too messy. Anyway, the sale will last only for a little, so if you still want to buy some, you better hurry. That sums up the week behind us. What we can expect for the next one is maybe a new LE collection, (just a random guess, don't take it for granted), though I'd rather not have it released yet. I don't know about Callie's Picks either, because they don't seem to stick to a certain 'pattern' when it comes to releasing collections and switching between Fashion and Decor. Anyway, as usual, vote, comment, and see you next week.